Forty years ago, Sly & The Family Stone were stars at Woodstock. 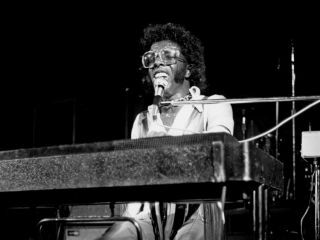 But today, the band's mastermind, funk pioneer Sly Stone, is practically destitute, scraping by on Social Secuity and living in campers and cheap hotels. At least that's the picture painted in Coming Back For More, an upcoming documentary by Dutch filmmaker Willem Alkema, who previously helmed another Stone doc called Dance To The Music. According to Alkema, Stone's financial woes stem back to a contract the artist signed in the late '80s with his former manager Jerry Goldstein. In exchange for the rights to Stone's music, Goldstein agreed to pay the entertainer "fixed expenses" and a regular allowance. A "debt agreement" ended those payments, and because Stone lacks the funds to hire an attorney, he's now forced to bounce from place to place, depending on Social Security checks to get by. A trailer for Coming Back For More - briefly serviced to YouTube but quickly pulled - states that the late Michael Jackson had commissioned Stone to write songs for what would have been his next album. Stone was apparently banking on those songs solving his financial worries.